Oh, Eric Clapton, how much I adore this song. What a perfect time for a seemingly random musical interlude from your faithful jester. You see, this blog has seen me meet many milestones, and this weekend another one will pass, one that is certainly more geared towards the message of Clapton’s song. I am getting married this weekend. Our first dance is “Wonderful Tonight” – my choice, of course. So this blog post is my defense of Clapton’s masterpiece, which was written for Pattie Boyd. She provided inspiration to both George Harrison and Eric Clapton alike; we do have her to thank for some awesome music. Clapton wrote it in 1976 as he waited for her to get ready. Yes, that simple. And that is my first argument in favor of using Clapton’s song for my first dance. It is almost minimalistic in its sincere simplicity. 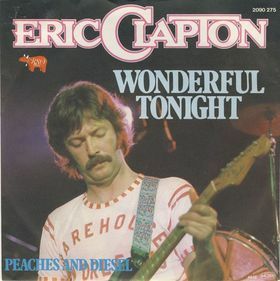 The song’s ultimate message is that “you were wonderful tonight” and that night can be extrapolated out – even though things didn’t exactly work out for Clapton and Boyd. The song is a microcosm for a loving relationship, and its lyric is a testament to that fact; the song just always stuck to me because it is lovey without relying on mawkishness. Argument 2 is the melody. The concise guitar whine that sits over a delicate rhythm, as if he wrote the melody with Boyd in mind as well. The song is sensuous without any lasciviousness, and that is not easy to do. The song drives forward methodically and is overwhelmingly enjoyable. Argument 3 is sentimentality. I’ve been with my current fiance for many years, and it has always been out song – yes, this was entirely my doing, but I’ve always connected her to it and that is another reason I love it. All in all, “Wonderful Tonight” the perfect choice for the first dance, and I can’t wait to hear it as we take the dance floor this weekend. Look out for more consistent posting over the summer!